As promised, I am back to talk about pricing. I have thought about it over the past couple of weeks (and taken copious notes on the subject). I realized that this is an enormous topic, one that should not be summed up on one person’s blog post. With that said I’ll get down to business. Oh and one more thing. I am only stating my views on the topic of pricing. These are some of the rules of thumb that I have learned from others along the way and through my own experience. I salute and honor all creativity however one expresses it and feel it all has value. How much is it worth monetarily in the that big world out there… Well lets try and figure that out together. My first bit of advice is to find your category. By this I mean, are you a career Artist, will you be making work for the rest of your life? Are you a Fine Artist/Craftsperson? Are you “crafty” meaning you love to make crafts in your spare time, you are not making this your life’s work, but you would like to sell what you make. These are important things to figure out. When pricing (and placing) work these things do matter. For instance, I do believe a person who is dedicated to lifelong career of being an Artist, who consistently and systematically works to build a career, has a regular studio practice and has ongoing shows does articulate a level of commitment that imbues value to their work differently than say those of the weekend crafter. It is only one factor though. We can factor in education as well, though the jury is out (my own personal jury) on this as I do whole heartedly embrace the Outsider Artists of the world and don’t believe it is entirely necessary for all people to jump through the flaming hoops of the Artistic academia, to prove that they are “real” Artists. Though education can’t be overlooked (it does show commitment). Those of us who have passed through those hoops and felt the flames of heat on our backs, can’t deny it’s influence on our development as Artists and take that aspect of our commitment seriously. In some circles your work won't be considered if you do not have the academic degrees to back it up. Next, how long have you been making your work? Are you just starting out? Have you been at it for two, ten, fifteen…twenty years? How long have you been showing and selling your work? Have you been published? Once you have figured this out then that will help you place yourself in your category. Second, figure out your costs. This is the nitty gritty. Expenses, I mean all expenses, materials, time, rent, photography, travel and everything that goes into making your work. Once you figure out the costs figure out how much time it takes you to make your work. It may vary from piece to piece but get a general idea of the time you spend making your work. Then give yourself an hourly wage for that time. Now this is a tricky one. This might be heavily influenced by where you live and cost of living in your area. I, for example, live in a very expensive place, which translates to a higher hourly wage for cost of living. Do the math figure out (as close as possible) the costs to make a piece. Third, do some research. Find out what others are charging for an item comparable to yours and by made by people in your category. Look in stores and galleries, take a look at what is being sold online. Take note of the pricing. This can get confusing too, but I do believe if you have figured out your category, taken into consideration where you are at in your career, know your costs for producing the work and how things are priced out there in the world you will get a clearer idea for pricing your own work. Also take into consideration that you might be selling the work at wholesale prices, which constitutes fifty to sixty percent of the retail selling price. With that said, there are a lot of mixed messages out there. It used to be (as I like to say in the olden’ days, which really was not so long ago…ten, fifteen years ago) that the boundaries of Artist and the value of work were much more clearly delineated. The Internet and things like Etsy are quickly blurring those boundaries. Suddenly everyone who has ever done anything creative is an Artist. Well yes and no. Just because I make a spreadsheet on my computer and do an analysis of my production costs, does that make me a financial guru? No, it means I did it because I can (and I have a computer program to help) but not because I am an expert in the field. There is a distinct difference. Okay, now that we have category, costs, done our research on what the going rate is for something of equal value, figure out a fair price that will pay you for your time and cover your costs. I would also like to emphasize that it is very important to give yourself room to grow with your prices. Don’t price yourself too high at first. If you are just starting out it is acceptable that your work be slightly lower than that of the going rate. If you find after doing your cost analysis that it is not possible for you to recoup your expenses as well as pay yourself then maybe consider not making that work to sell. Sometimes we love exquisite materials, which in turn give us exquisite prices or the amount of labor it takes to execute the piece makes it impossible for us to sell the work for what it is worth. If that is so then I would consider making this type of work for special occasions such as a show or a special order from someone who understands the value and is willing to pay for the added cost. People will (and should) look at your history as an Artist. Emerging Artists are not expected and should not have the same prices as mid career or mature Artists. You think my prices are high, take a look at Ruth Duckworth, she asks $1200 one of her cups and so she should, her work is phenomenal and she has the resume to back it. I have a long way to go before I can ask for prices like that. I have to earn it, prove my commitment and most of all, make good work. However it is never in your best interest to lower your prices after you’ve put your work out there. It devalues your work. Also, don’t under price yourself. By doing so you not only do a disservice to yourself but to other Artists in your category as well. Once you put your work out there with a price tag on it, you become part of a greater community and it is very, VERY, important to value yourself, your work and in doing so you uphold the same ideal for your peers. I feel very strongly about Artists getting paid for their time. Too often it is assumed that we do what we do because it is “fun” and in turn is translated, as “you should do it for free.” We all know the truth, so many of you have written to me with your truth and the reality of that truth is that until we take ourselves seriously no one else will. After a very long hiatus my canteen vases are finally back! I was separated from my molds all of last year and since I have been back in San Francisco all of my attempts to get these guys done have been ill fated (er, no pun intended). So they have returned...The lovely, curvaceous, two sided canteen vase. These sweeties are soon to be sent to a very special store in Los Angeles called Show. In the studio, I am having a bit of problem with my glazes crawling and underglazes peeling. I am coming to the conclusion that I might be working with an inferior product and that it is not remediable. Or it is just my greasy little fingers contaminating the surfaces...most likely not the latter as I am constantly washing my hands. I have had a lot of losses lately which really frustrates me (and the people who are waiting on orders). The good news is that I do have some more of these guys for sale. New colors too! These are a little smaller than the last cups I posted, 8oz and they have a lovely sprig flower on them. I have a handful of them available in flame orange, gray green(sold), and natural (sold) and they are $30. Pop me an email at diana@dianafayt.com if you would like one. There are still a few orange ones left! A late breaking (but not too late) tidbit. My friend and fellow potter, Ayumi has some gorgeous work for sale at Akar. Check it out here! One of each for me please! Love, love, love, what Ayumi does! Do you remember when I excitedly began working on the new nasturtium bowl and I showed you the picture below (on the left) of the new green I was using without having made a test of it first? You all commented on how much you liked the color. I was brave (and naive) to think that it would be close to the color it was out of the bottle. I can only laugh at myself for being so bold. See the wee bit of green on the inside of the bowl on the right? That is the color it turned out. A lovely shade of baby poop brown! Actually I love the color and it goes quite well with some of the other new colors I have been doing tests of. I just hadn't expected it to turn out so far from the color on the left. So remember friends, always make a test before you boldly go where no other ceramic artist has gone before. I also wanted to let you know that I will be teaching a workshop in July ( It was originally set for May 26th but was changed because of the Memorial Day holiday). 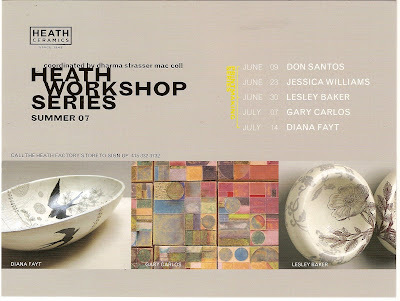 It is at the fabulous Heath Ceramics Factory in Sausalito, California. It was a blast last time I taught it and I am so looking forward to teaching it again. I hope to see some of you there! It makes me uncomfortable to talk about money. Especially when it comes to my own work. I guess on some level I feel I shouldn't have to explain myself or that it is unsavory for an Artist to talk about it. Perhaps it is but I feel it is important to offer some explanation of why things are priced the way that they are. If I don't talk about it then how will anyone know? I know that people often suffer "sticker shock" when they see the prices on my work. I have been selling my work professionally for thirteen years now so I have a pretty good idea of what people expect to pay when they see an object that is made from clay. Especially if it is in the shape of a bowl, vase or plate. Even I do it. I have that preconceived notion in my head too, equating function with frugality. So when someone writes to me and asks "I would like to buy your large bowl, how much is it?" and I tell them $320. Often times I get no response in return which I interpret as "it is so expensive... How can she charge so much for just a...bowl?!" I have read it on blogs too, I love her work but it is too expensive for my budget. I understand that it is shocking and this does not upset me, $320 for anything requires some thinking about before splashing out. 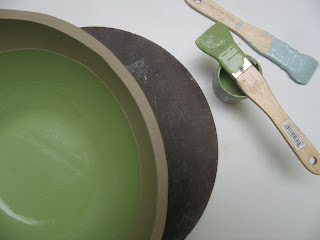 What goes into the making of those ceramic bowls, vases and plates is a lot more work than usually meets the eye. Anyone who has taken just one pottery course usually gains an immediate appreciation for the labor that goes into making ceramics. I often hear things like..."I took a pottery class intending to make all of my Christmas presents and all I ended up with is an ashtray...and I don't even smoke!" Any object successfully made out of clay is highly deceiving. That is the beauty of the medium. It gives off the air of simplicity, ease, some say a calmness but in truth the mastery of making things from clay that look that way require an immense amount of skill. People who work with clay do it because they love it and also because there is a bit of the masochist in them. When people say to me you must be so happy to "play with clay" I want to well ... scream. I rarely "play with clay" and really it is not respectful to the craft. In fact I heard Oprah say it the other day (did I just admit that I watch Oprah!?) while she was doing a spot on Jonathan Adler. He just smiled and was gracious but I wondered if that statement made his blood boil just a little. Anyone who is serious about the medium knows that there is nothing playful about it at all. The outcome may look playful in some cases but what goes into making it is a whole lot of work. Plain and simple...work! When it takes me hours to make, paint, etch and glaze just one piece and then throw it into a kiln, not just once but twice and it may or may not turn out that is what goes into the cost. Also consider the cost for studio space, equipment, materials, education on top of the hours spent making the work. Honestly I don't think any ceramic artist/potter ever charges enough when you compare the hours they put into making their work to lets say a lawyer or a computer programmer. Those are professional realms where people rarely question their hourly wage. (we don't like how much they charge, but never the less we accept it). Even though those services provide as much function in our lives as the bowl we eat our cereal out of every day. Mold making and I don't always get along though I persist in making us life long partners. If you asked the plaster's opinion (if it had one) it would say I was out of my mind and that I am delusional about my abilities and mathematical skills. I say, I like math and think I am quite capable. I think that I can figure out the weights and measures that making the proper plaster mold requires but alas the delusions endure and I am often faced with head scratching concentration and confusion only to give it up and rely on the "other" less sophisticated method of making plaster molds which requires no math at all, just the ability to move fast and eyeball it. I know I can do it the correct way but am often feeling pressed for time or just plain anxious to get the job done that I don't take the time to figure it out. When I want a perfect mold, lets say for slip casting, I hire someone else to do the the job. Though deep down I really want to do it myself. The plaster, says "give it up already, would ya!" Once again I am about to embark on a mold making adventure and I am determined to get it right. I've decided to stay small (some two part vase molds) that won't require large quantities of wet plaster as I am also known to have a deluge of wet plaster flood out of my coddles. I am really not sure why I persist in this endeavor. It seems silly after so many failures at something to not just give in and say, look I am just not good at it...but I want to succeed at this. I actually love the whole process of making the model and preparing it for a mold (which is a lengthy process that requires precision). It's the plaster part that messes me up. Everything else I have figured out just not the plaster. So wish me luck. I'll be back to let you know the results. By the way, I did make all the molds in this here photo, though these are not the kind of molds that require much skill, just the fast moving eyeball it method. "Yeah, so what" says the plaster, "lets see you make a real mold!" I'll show you...you pesky plaster, as long as it is up to me we will get along. So there! Well today is the workers holiday and I took full advantage of it. I tried to work but was terribly unmotivated...so I took the day off. I drove past a large group of folks headed towards the park to honor the day, people had flags in hand and so many stores were closed in recognition of the holiday...wouldn't you know it the one day I decide to splurge and buy my lunch...well it wasn't meant to be because today we honor the worker. Oh and the Maypole, this photo is inspired from the colorful Maypoles that many people are dancing around today. Hope you are all honoring workers today (yourselves!) and maybe even doing a little dancing around a Maypole. By the way these cups are for sale! (They have all sold...but if you would like one I can make them to order). They are $32 each. Please email me at diana@dianafayt.com if you would like to order one (or all) for your own.